If TED took a turn to leftist (or any) critique, Žižek, the professor of “toilets and ideology,” would be the keynote speaker. The irony of the animated lecture, “First as Tragedy, Then as Farce,” is that a diatribe on “global capitalism with a human face” would get over 900,000 views on YouTube. 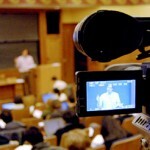 With YouTube’s help, the academy where Žižek’s persona was born is an increasingly visible terrain of so-called “cultural capitalism.” The last decade has witnessed a revolution in open courseware, a source of short-circuit consumption in which anyone with a computer can drink élite university Kool-Aid without earning credit. The movement has been so explosive – the Hewlett Foundation, which provides the mother lode of funding for university initiatives, supported a whole book on it, Taylor Walsh’s 2011 Unlocking the Gates – that one wonders how long the political economy of education that it anchors, contra Žižek’s hipster-friendly fantasies of consumerist dystopia, will last. A standard feature of the hand-wringing associated with the crisis of the university is a fixation on the humanities. After all, for those of us in the so-called creative and critical fields, illustrating, visualizing and – dare we say it – branding the crisis is a new and unique opportunity to show off. This is what we went to school for, isn’t it? Take a recent event at Cornell University, which dramatized the question with the following thought experiment: after some sort of maritime disaster (details are scarce), a group of undergraduates commandeers a life raft. As luck would have it, they have a bit of space left – but, tragic twist of fate, the only people left to save are professors. Instead of giving up the seats to their elders, our clever young narcissists make the professors present a case as to why they deserve the remaining spot on the life raft. The movements of the unemployed, which first emerged in Argentina in the mid-1990s, challenge traditional representations of the unemployed as lacking political agency and revolutionary potential. 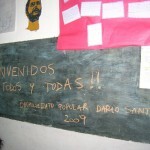 While many Marxists and labor organizers have maintained the latter position, Argentina’s recent history paints a different picture: the militant organization of the unemployed across the country was instrumental in overthrowing the neoliberal government in 2001 and steering the course the country would take following the economic crisis. Movements of the unemployed in Argentina are redefining work through their organizational practice, discourses around labor, and active creation of different forms of production and reproduction. A majority of the Left has turned its back on the universal, without wanting to know what potentialities it could have for struggle.